Shuos Jedao is unleashed. The long-dead general, preserved with exotic technologies and resurrected by the hexarchate to put down a heretical insurrection, has possessed the body of gifted young captain Kel Cheris. Now, General Kel Khiruev’s fleet, racing to the Severed March to stop a fresh incursion by the enemy Hafn, has fallen under Jedao’s sway. Only Khiruev’s aide, Lieutenant Colonel Kel Brezan, appears able to shake off the influence of the brilliant but psychotic Jedao. The rogue general seems intent on defending the hexarchate, but can Khiruev – or Brezan – trust him? For that matter, can they trust Kel Command, or will their own rulers wipe out the whole swarm to destroy one man? It hasn’t even been a year since Ninefox Gambit came out and I already read it twice. The first installment in Yoon Ha Lee’s Machineries of Empire is brilliant, full of amazing ideas, original worldbuilding and gorgeous writing. 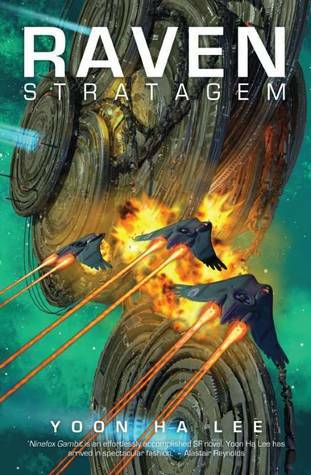 It was even better as a re-read and let’s just say that I was extremely eager to get my hands on its sequel Raven Stratagem. I am easily disappointed by sequels, usually I tend to enjoy first books more because they are the most surprising, you discover the world, the characters, the plot, everything feel way more original and new because you are introduced to something original. So, as much as I was anticipating Raven Stratagem, I was a bit scared. Well, I had absolutely no reasons to be since it was freakin’ awesome. Yoon Ha Lee perfectly managed to build on what he created with Ninefox Gambit, it never felt like a filler-book at all, it was captivating read and if I hadn’t been reading this slowly on purpose to savor everything, I could easily have devoured this in a few days. If you haven’t picked up Ninefox Gambit yet, please do! If you read the first book and found it a bit too confusing, I would still highly recommend picking up the sequel since, I personally found it less complicated than the first book. Indeed since the world has already been presented to us in the first book and, even if some new elements are introduced, it is not as overwhelming and several things thatwere a bit complicated in Ninefox Gambit are explained a bit more in the sequel. Shuos Jedao, the now resurrected mass-murderer, is in control of Kel Cheris’s body. His aim? Destroying the Hexarchate, the oppressive system that detained him for centuries and tried to turn him into a gentle puppet. As the book opens, Jedao takes control of General Khiruev’s fleet to fight off the Hafn who are threatening the existence of the Hexargate. But what really are his intentions? Does he really want to defend the system he tried to destroyed centures ago or is it another scheme? This book is fascinating in so many ways. First of all, as much as I missed Cheris and Jedao’s interactions, the new characters introduced were a real treat and seeing them interfere with Jedao was priceless. I especially enjoyed the fact that we get the chance to see much more of Shuos Mikodez who appeared only briefly in Ninefox Gambit. For some reasons, this character reminds me a lot of Varys, the Spider, in Game of Thrones. In Raven Stratagem, Yoon Ha Lee teaches us a lot more about the Hexarchate and the way it actually work. If you don’t like politics-heavy novels, this series is not for you, it’s not as heavy with politics as Too Like the Lightning by Ada Palmer but Raven Stratagem definitely has its share of political intrigues. I could say the same for space battles though, I usually don’t like battle scene in books, I don’t mind a few of them but, after a while, I grow bored easily. However, I never felt bored while reading any of the battle scenes, they are so unusual, everything being based on maths that it trying to imagine how the battle actually enfolds is both complex, mindblowing and far from boring! I also appreciated Yoon Ha Lee discussion on genders, it was already fascinating in the first book since Cheris and Jedao were both sharing the same body but it was even more so interesting in Raven Stratagem. Indeed, Jedao is now habiting Cheris body and it seems to upset several characters. The way they viewed Cheris’s body as “not Jedao” and Jedao as a “body-thief” was very interesting especially if we take in consideration that Yoon Ha Lee is himself a transgender man. I am sure that when I’ll re-read Raven Stratagem, I will see even more interesting themes and discussions. Those books are so layered that re-reading them is always a pleasure because you can discover so much more of what they offer. Anyway, as you may have guessed, I love those books, I am extremely glad that Ninefox Gambit was shortlisted for the Arthur C. Clarke, I haven’t read all of the books nominated (I will!) but at least for now, I truly hope that it will win! I am sure that the Machineries of Empire will be a cult series and that it will inspire people for years. Highly recommended. I read this book as an ARC kindly provided by Solaris through Netgalley but I preordered a copy as soon as I finished it. It is definitely something that I will re-read again and again and push in the hands of many. I received a copy of this book from the publisher in exchange for an honest review. My thanks to Solaris and Netgalley. All opinions are my own. A couple of weeks ago I started reading Ninefox Gambit, and although I was fascinated by the premise and the world the author describes, I was also quite confused – granted, that’s the “price” we have to pay for this book, since the confusion is shared by many readers, but I could not move forward because I realized I needed to give book 1 all my energies and attention, and right now is not a good time. However I’m happy to learn that the story becomes more accessible with book 2, and I will keep that in mind once I try again Ninefox Gambit. I intend to return to Ninefox Gambit once I have more time and mental energies to deal with it (it sounds like a perfect holiday project – LOL), because the premise *is* intriguing and I want to know how it develops. Can. Not. Wait. My next read once I finish The Prey of Gods. June had all of my hot releases this year. I’ve waffled on my decision to continue the series, but ultimately I think I’ll bail – book one was really wild, but probably not my type of SFF when all is said and done. Glad to see you enjoyed this so much though!